Today I want to share with you my experience with this L'oreal Paris True Match LUMI Cusion foundation. I bought this L'oreal foundation nearly two months ago during that time when I was desperately looking for a good foundation (I didn't care any perfect foundations anymore) for my dehydrated sensitive skin. Before I picked up this L'oreal Paris True Match LUMI Cushion foundation, I remember, I had tried pretty much every liquid foundation from Becca to Nars to Gorgio Armani to Givenchy at the nearest Sephora store but they either looked too greasy or too matte on my skin. Ok, let me start from the packaging of this L'oreal Paris True Match LUMI Cushion foundation: it's nice, sturdy and looks adorable __ I love the rose gold shade of the packaging. I got it in Shade W2 (light ivory) that matched perfectly with my skin. What I love about this cushion foundation the most is its amazing dewy finish. 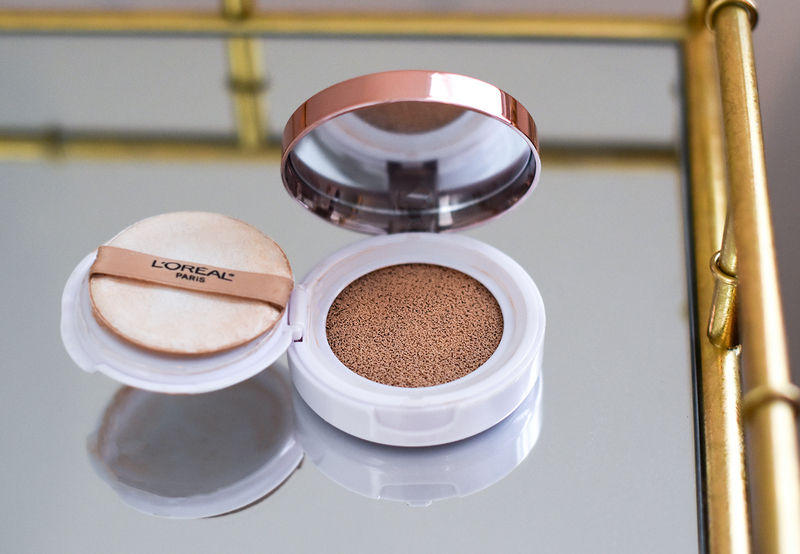 This L'oreal Paris True Match LUMI Cushion foundation made my skin looked amazing when other, high end foundations looked afwul on my dehydrated skin, this spring. It's light coverage, even though the label claims it's buildable, I could not build it to nedium coverage. It didn't break me out like most of the drugstore makeup products do to me, so it was a big plus. What I didn't like about this L'oreal cusion foundation is that it's not long-lasting. In 4-5 hours after applying it, this foundation breaks up and settles into the pores. The price is not very high but if we keep in mind that the actual amount of the product we get is only 14 ml, it's not cheep either. Overall, I didn't regret buying this cusion foundation because I still enjoyed using it for a few weeks, I never applied it before any important meeting or long events, though. If it lasted little longer on the skin, I would probably repurchase it. Have you tried this cusion foundation? Let me know in the comment section below. It looks like it will really feel good on the skin and the packaging is beautiful. I have never tried a foundation like this before. I need one to last longer so maybe I will try to have for touch ups. It seems like the perfect size for a handbag. Thanks for sharing Nina! I like the concept of cushion foundations in general, they give the skin amazing dewy finish. You should try any cusion foundation, I think you will love them too, Kathrine. This is a great touch up product and one I must try, but my fave cushion foundation has to be by Innisfree, it's awesome! I will definitely give that one a try, Lotte. I personally will stick to the normal version because this is just too pricey for drugstore. I know, it is little pricey for the amount of product you get from this drugstore brand. I haven't tried the original one yet. I heard great reviews about this, and my sister kinda like it too. I heard that Chanel just came out with a cushion foundation that is really good. The formula is a more gel textured if I am not mistaken but obviously on the pricier side of things. I will definitely check out Chanel one too, since my skin 'loves' cushion foundations. 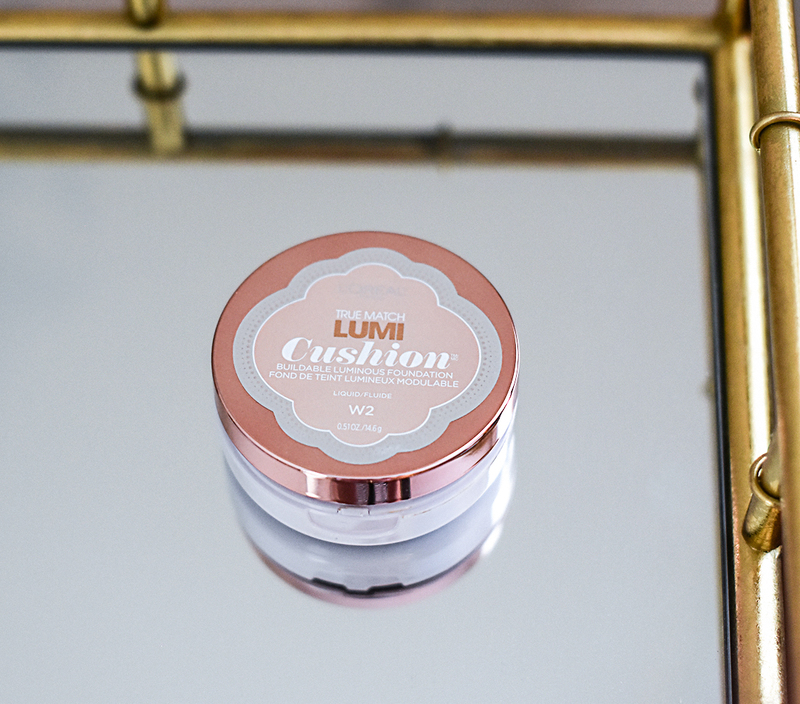 I haven't tried cushion foundations, so thanks for the review on this one! This foundation looks great! Thanks for sharing! I really love the packaging too, the rose gold is so pretty! Too bad it doesn't last that long. Based on your review, it seems like a great casual go-to foundation and good in a pinch. But definitely not for full day coverage. Thanks for the tips! The packaging alone looks terrific. I hope they improve what needs improving in this product. This foundation sounds like a dream. Love the affordable price point too! I love the rose gold packaging and I like the sound of the dewy finish, but it's a shame it doesn't last a bit longer! The packaging looks great and sounds great! I prefer the normal versions of foundations over the cushion ones as i find these really pricey ! I tried this foundation too and it does not last all day long on my oily skin. Since I once tried cushion make-up I love the comfort you have with a cushion make-up. I have been debating trying this for ages, I may have to give it a go after reading your post.